Although several Hawleyville residents expressed public safety concerns about allowing a proposed gas station/convenience store to operate at 13 Hawleyville Road (State Route 25), Zoning Board of Appeals (ZBA) members have unanimously endorsed having such a facility at the 3.7-acre site within the Hawleyville Center Design District (HCDD) zone. On March 13, ZBA Chairman Alan Clavette, Jane Sharpe, Joseph Bojnowski, and Robin Buchanan approved the application for a certificate of location from the firm known as 13 Hawleyville Road LLC, which owns the land. Besides the ZBA approval, the firm also requires approvals for the proposed 4,400-square-foot building and fuel pumps from the Inland Wetlands Commission (IWC), the Planning and Zoning Commission (P&Z), and the state Department of Transportation (DOT). In early February, the ZBA issued a certificate of location to NEMCO Limited Partnership to build a 3,277-square-foot gas station, convenience store, and cafe at a 0.7-acre site at 26 Hawleyville Road, which also is in the HCDD zone, about 2,000 feet north of 13 Hawleyville Road. The NEMCO project has gained P&Z approval and is awaiting DOT approval. It does not require IWC approval. Civil engineer Dainius Virbickas of Artel Engineering Group LLC, representing 13 Hawleyville Road LLC, presented “conceptual plans” for its project to the ZBA. Engineering drawings indicate an entry/exit driveway at the property’s frontage on Hawleyville Road, just south of eastbound Interstate 84’s Exit 9 off-ramp. The drawings show a secondary access point for the site on Covered Bridge Road. Mr Virbickas later said that as currently proposed, the Covered Bridge Road access point would be an exit-only driveway. “We’ve got quite a long process before us,” Mr Virbickas said, noting the many approvals that the project requires. 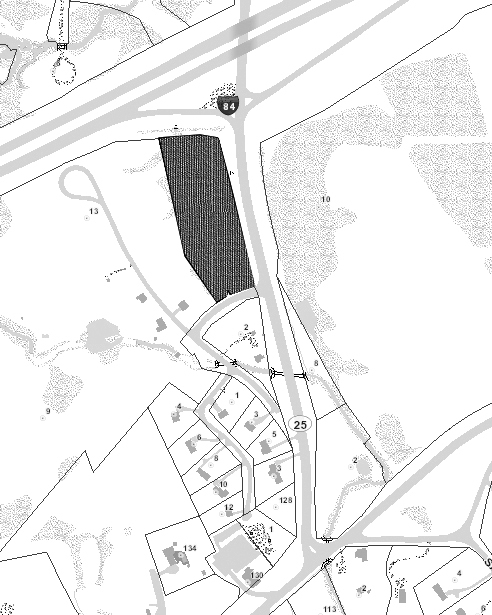 The 3.7-acre property at 13 Hawleyville Road, where the gas station/convenience store would be built, was one of three components of a multi-pronged development proposal approved by the P&Z in 2015, under the terms of the P&Z’s Incentive Housing (IH-10) zoning regulations. The components of that overall project were the 180-unit Covered Bridge Apartments rental complex at Covered Bridge Road, which contains some tenants and remains under construction; the new Grace Family Church, which has been built off Covered Bridge Road to replace the congregation’s Mount Pleasant Road church; and a diner with an 80-space parking lot. Plans for the diner, however, fell through, with the 3.7-acre property now proposed for the gas station/convenience store. Mr Virbickas said that approval for gas station construction at 13 Hawleyville Road will be sought under the terms of the HCDD zoning rules, which were modified in September 2018 by the P&Z at the request of NEMCO to allow a gas station as a permitted land use in the HCDD zone. Because it would be located in the HCDD zone, the 13 Hawleyville Road facility would include a building that is “tastefully designed” and “rustic,” he said. Notably, the NEMCO project, in keeping with the tenor of the HCDD zoning rules, is planned to be built in the style of the former Hawleyville railroad station. Mr Clavette asked Mr Virbickas why the proposed gas station’s proximity to the new church would not be an issue in terms of the gas station’s nearness to a place of public gathering. Mr Virbickas responded that the two facilities would be separated by some wetlands. Asked by Mr Clavette about the public safety features that would be employed by the proposed gas station, Mr Virbickas listed a range of safety devices that would be in use there. During the public comment section of the ZBA hearing, Pat Napolitano of Whippoorwill Hill Road told ZBA members that the gas station is being proposed for “a dangerous location” where there is already much traffic. The site is near a 180-unit apartment complex under construction and also near a church, he said. School buses will be traveling through the area, he added. Mr Napolitano pointed out that the area near the site does not have traffic signals. He said there is a major child daycare center nearby at the intersection of Hawleyville Road, Mount Pleasant Road, and Saw Mill Road. He also objected to the proposed gas station having a pump that would dispense diesel fuel, saying that it would attract trucks to the site. When considering that a gas station was recently approved for a better location, 26 Hawleyville Road, there is no need for another gas station in Hawleyville Center, Mr Napolitano said. Vern Gaudet of Hillcrest Drive told ZBA members that there is also a child daycare center on Hillcrest Drive. “I’m concerned about safety,” Mr Gaudet said. Janet McKeown of Hillcrest Drive expressed her concerns about traffic generated by the proposed gas station/convenience store. She predicted that there would a rash of rear-end collisions involving northbound motorists on Hawleyville Road who are seeking to make a left turn to enter the proposed facility. “Accidents are going to happen,” she said. Questioning the need for the proposed gas station, she said that the site of a former nearby gas station on Mount Pleasant Road may again have such a use. Ms McKeown also pointed out that the new Grace Family Church is near the 13 Hawleyville Road site. In the motion to approve the certificate of location for the gas station/convenience store, ZBA members agreed that the site is not near a place of public gathering and that a substantial number of safety devices would be installed at the site in connection with the dispensing of automotive fuels. At the 13 Hawleyville Road site, the developer also proposes construction of an approximately 3,350-square-foot freestanding canopy situated above five traffic islands, which would have gasoline pumps. The canopy, which would measure about 140 feet long by 24 feet wide, would lie parallel to Hawleyville Road. A separate 720-square-foot freestanding canopy would be positioned above a diesel fuel pump. The site would have two 20,000-gallon underground fuel storage tanks. Engineering drawings for the project indicate 29 vehicle parking spaces. The HCDD zone is a specialized zone unique to Hawleyville Center that was created by the P&Z in 1999. The HCDD zone is intended to foster the creation of a neighborhood business district that includes mixed-use activities, improvements, and the development typical of a village center. The zone is designed to promote business activities that will serve the surrounding neighborhoods, and to a lesser degree, accommodate services compatible with the zone’s proximity to Exit 9 of Interstate 84.